The history of The Fulton Railroad Company, Ltd. and Cincinnati Barge & Rail Terminal, LLC offers a fascinating look at Cincinnati’s backstory as the country’s first Western boom town. This is the 4th chapter of a 4 installment story of the site’s many uses to the community and in domestic and international trade. This series premiered in The East End Newsletter in early 2013. Fulton Railroad in the 21st Century. In the second half of the 20th Century, as suburbs boomed, the cores of American cities declined. Cincinnati was no exception. Few people considered moving downtown while many left, resulting in a population drop from over 500,000 in 1950 to under 300,000 today. 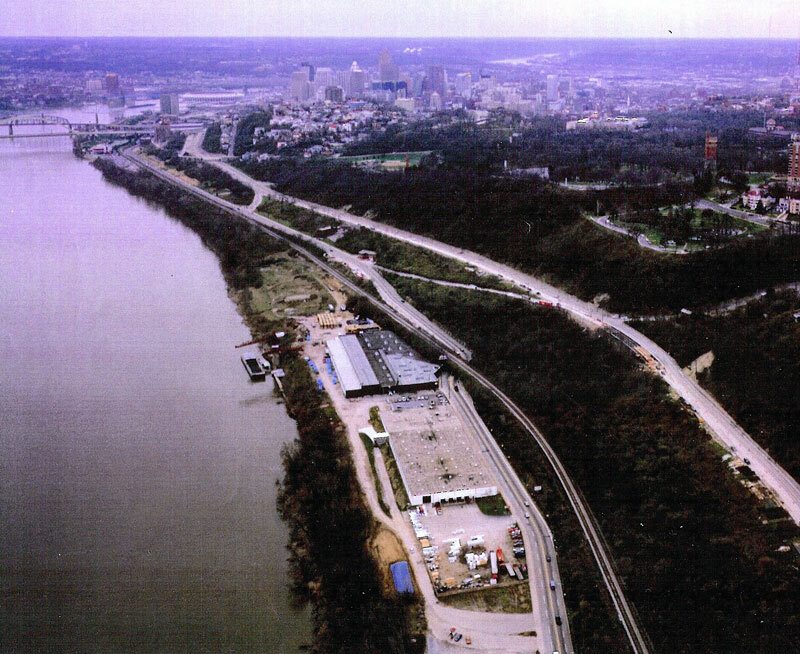 In the late 1970’s, local entrepreneur George B. Stewart envisioned a redevelopment opportunity along a lengthy stretch of Cincinnati’s industrial eastern waterfront. He embarked on an ambitious plan to revitalize the area acquiring and improving dozens of East End land parcels. 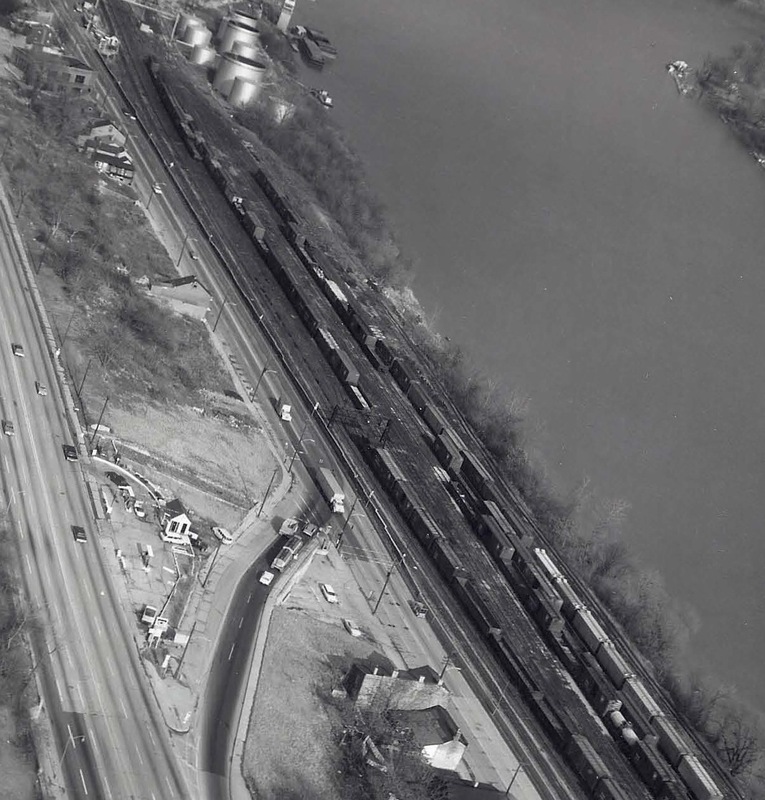 Trains parked at the corner of Bains Place at and Eastern Avenue in 1969. During the late 1980’s, Stewart acted to remediate environmental damage and improve aesthetics on today’s CB&RT site. Sawyer Place removed and cleaned up The Rookwood Oil tank farm, and recycled old rail connectors aligning with his vision for a more resident friendly location on the banks of the Ohio. To generate a look he hired famed architect William Turnbull, Jr. (the San Francisco based designer of Sea Ranch and vintner of Turnbull wines) to develop early sketches for the original Adams Landing project. In the early 1990’s, The Rookwood tanks were removed/remediated improving neighborhood aesthetics. 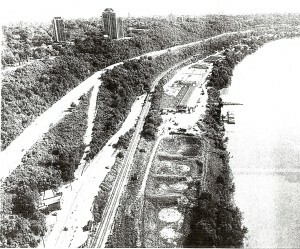 Continuing the recycling theme, concrete excavated from the old Fort Washington Way supplied the fill for the indentations (seen in the photo above). The usable port space, all above the 500 year flood plain, offers accessibility along the Ohio, drawing business when other ports close due to high water. The crane yields great safety/security value in any roadway/bridge, flood, or wartime scenario. A train enthusiast for decades – including being the last train owner at Union Terminal when it shut down in 1973 – Stewart acquired, rebuilt and maintained the Oasis line for decades. The Fulton Railway Co. formed in 2001 with full class 3 railroad rights on the short line of The I&O (Indiana & Ohio Railway). 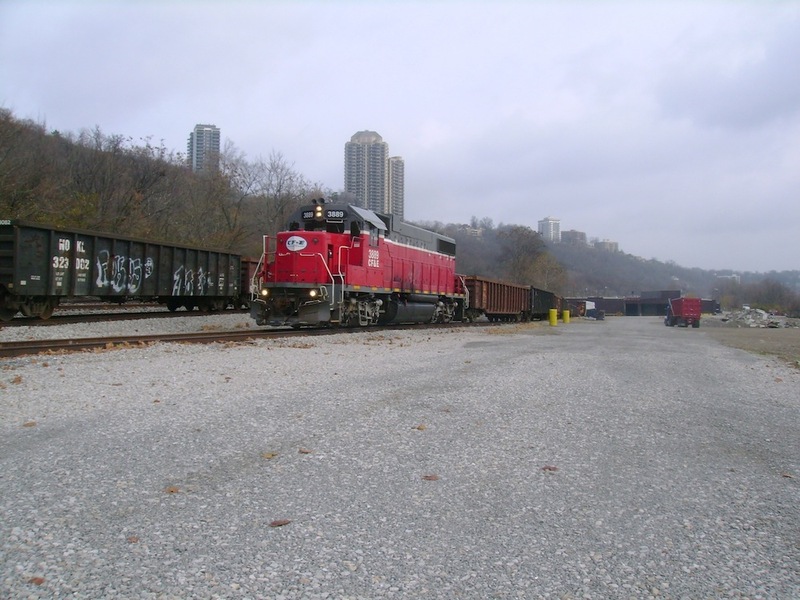 Working in concert with the Cincinnati Park Commission, Stewart removed large stone piers and permitted an easement to (the then un-built) Friendship Park so that park goers could cross the rail road tracks by foot, car and bike. Bit by bit, Stewart’s mixed use vision took shape. Today, the smaller warehouse’s tenants distribute media and roofing materials. The larger warehouse supports shippers and receivers of steel, iron, aluminum and lumber products. 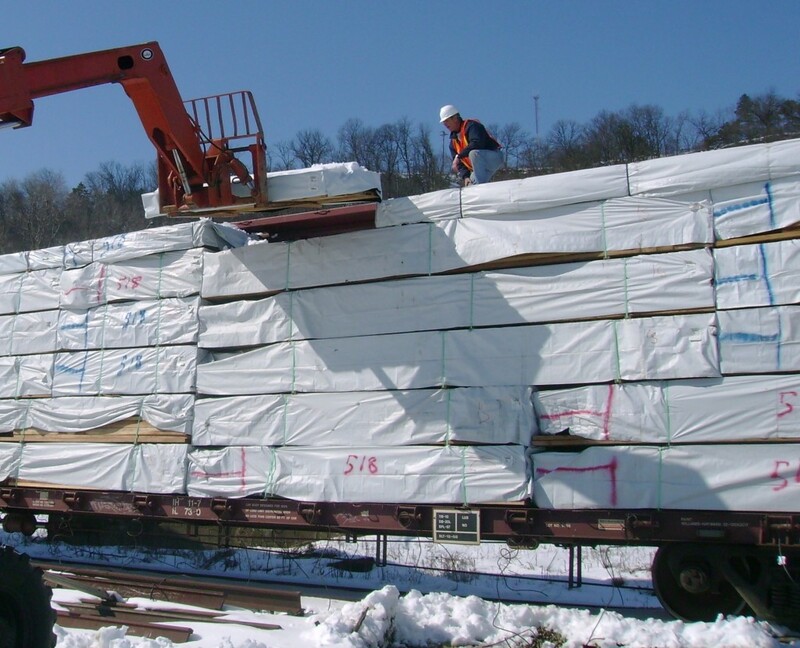 The terminal offers loading, unloading and storage services by road, rail and barge. 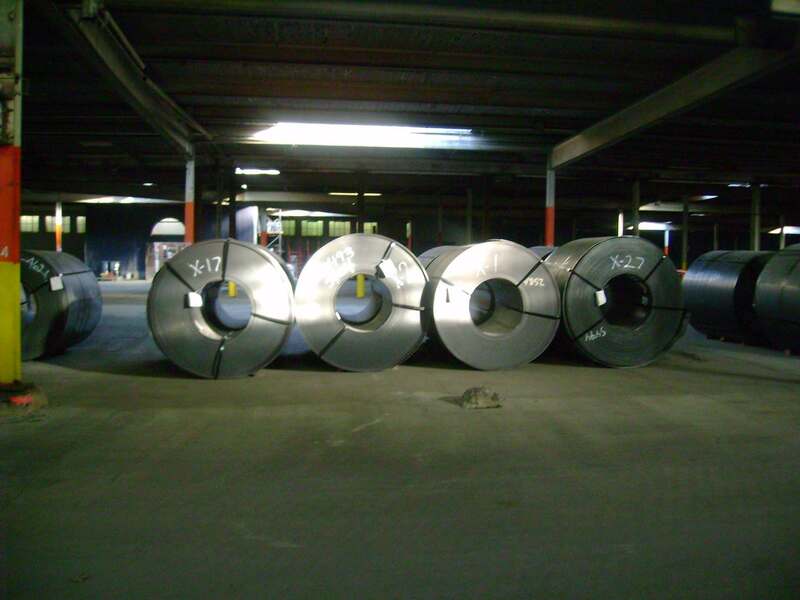 In the mid-1990’s a conveyor system was installed and placed in operation to handle iron ingots, which feed steel mills to make cars and appliances. The vitality of the port can be measured in the thousands of jobs it impacts and makes possible due to its cost saving location at midpoint of the Ohio and with combined onsite river and rail access. Steel sheet coils in the main warehouse built in 1907. CB&RT undertook a systematic reinvestment in the terminal operations during a difficult period in US history, The Great Recession. To remember the depths, recall that GM went bankrupt and Detroit actually stopped making cars. This sapped the business of the terminal’s tenant, then dependent on the auto industry’s health. The tenant cancelled its lease after 20 years and major repairs beckoned. Banks gasped and turned down all loans. This was the right moment to take a chance with private capital to rebuild this vital asset for the city and region. Redwood lumber from California for local wine cellars arrives at CBRT. By 2010, The US Department of Transportation had ramped up initiatives to take traffic off the roads, to save fuel, to preserve air quality, to stimulate the economy and capitalize on The Panama Canal expansion. Barges take stress away from bridges and interstates by replacing truck traffic. OKI and the Ohio Department of Transportation awarded CB&RT a $1.3m grant to continue it’s work in utilizing the river for freight in 2012. The same year, Genesee & Wyoming acquired the I&O Railroad greatly improving the Queen City’s transit network. George III (if you count Steinbrenner and Carrell on the site) was also able to bring his progeny into the business. Jeffrey, has taken on his father’s role in running the business with 25 years of container shipping, salvage and commercial rental management. He is a founding member of CORBA (Central Ohio River Business Association) and has extensive Latin American trade experience. Richard and daughter Merrie assist in operations, planning and marketing. GM Tim Roddy leads the day to day terminal operation for the CB&RT with over 30 years of river port management, including decades on the same site. Along with the Port Authority and CORBA, CB&RT has underscored Cincinnati’s vitality as a commercial shipping center. 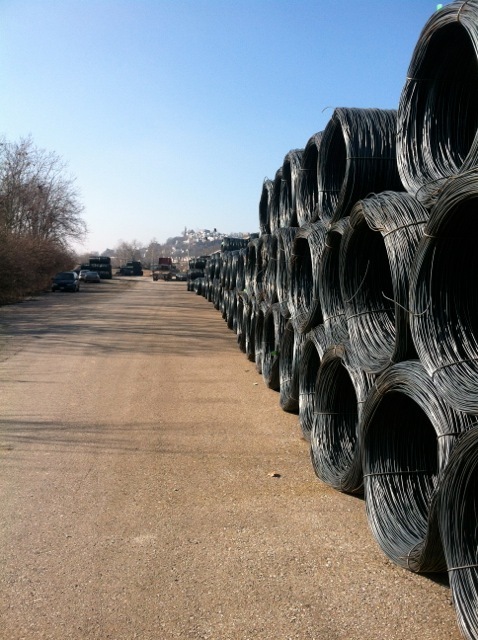 Coils stacked for departure in 2012. In the 2010’s, CB&RT has distributed trainloads of Redwood imported from California to East End wine cellar makers. It has also hosted the laydown for the largest skyscraper built in the US in 2009, as Great American Tower was staged onsite. Commerce and innovation abound on the river, as always. Jumping on a steamboat past this stretch of river was not too different in the days of Twain, Leathers and The Marine Railway. Reports of the port’s death were greatly exaggerated! 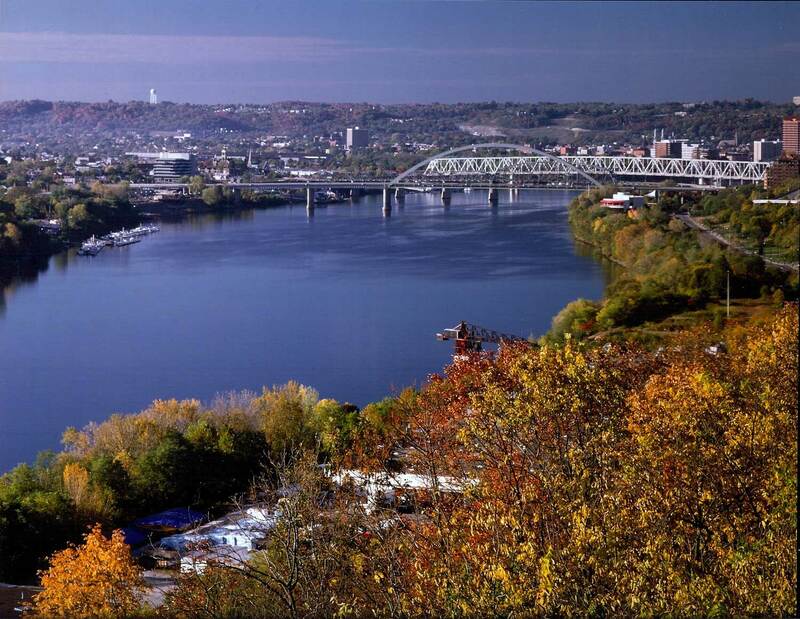 With its use of barge and rail to move freight, CB&RT is an eco-friendly artery. It is not only a window on the rich past of Fulton, but the door through which much of the city’s substance arrived over the past two centuries. When the primary industry was steamboats, it was the city’s first manufacturing hub and the loudest spot in America. It became a lumberyard, rail yard, sawmill, ship repair center, and warehouse, continually spawning jobs (and characters). As skyscrapers and suburbs were built, it provided space to store supplies in transit. It’s connectivity flourishes today, spurring trade with China, Japan, Korea, Brazil, Turkey and Russia. Join us in commemorating Fulton Shipyards’ Bicentennial (1816-2016).